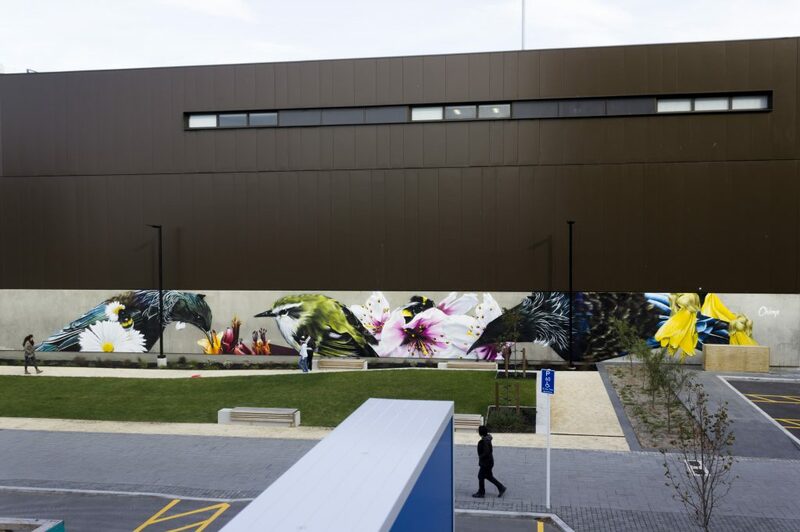 How does an artist from Wellington find himself painting a huge wall at Christchurch’s new Justice and Emergency Services Precinct? How did the commission come about? I was originally quite surprised to hear from them when the email came through from the Justice Department. I thought I may have been in trouble or something before I read it! They had seen my work on social media platforms and liked it. It was quite flattering to hear from them and I really appreciated the opportunity. I imagine most people would be a little wary of an unexpected email from the Department of Justice! Did you have to think about it for long? Obviously different artists will have different ways of analysing and reconciling who they work with, is that something you had already thought through with commissioned work generally, or was the Department of Justice a slightly different proposition? It was a bit of a surprise, but I was mainly curious as to what it could be about. We organised a meeting to talk about the possibilities of the project and it sounded like an awesome opportunity to expand my work into the South Island. Having a lot of family in Christchurch made it an easy choice to head there. What type of entities have you worked with in the past, and how do you reconcile the compromises you often have to make with work for high-profile organisations? Do you separate commissioned public work into different categories based on what freedom you are afforded, or do you try and ensure you can balance the client’s wishes with your own vision? Just before the Christchurch Justice Department contacted me, I had recently completed a mural for the New Zealand Parliament Buildings. Throughout the design process, I find it easiest to see what the client is wanting in terms of the topic of the design and the aesthetic they want within the design. Sometimes clients reference parts of my previous pieces that they have seen. From there I create a design and send it through to the client and we alter it back and forth. I find this process the best for me to ensure that there is a balance between my vision and the client’s ideas. 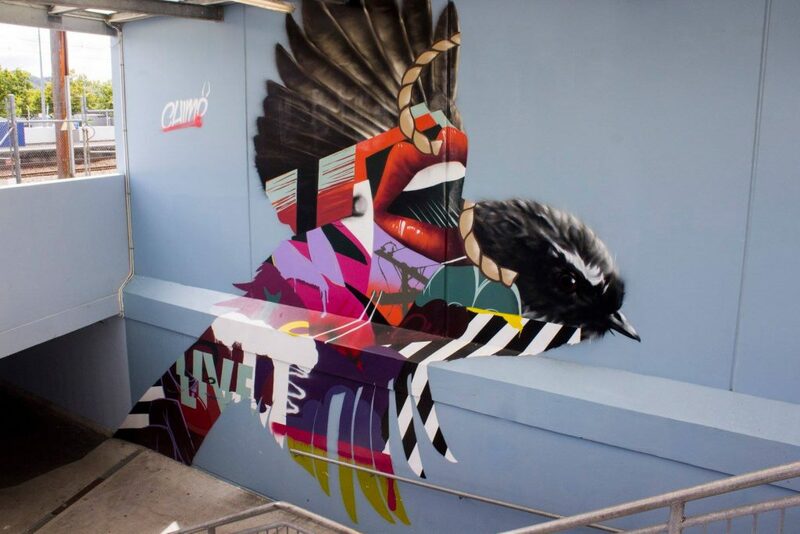 With the Parliament job, for example, they had said that they liked my birds incorporated with the graffiti art, so I sent through a design and they seemed to allow a lot of artistic freedom as the design only had a few minor tweaks from the initial concept image. Speaking of that distinctive personal style, how did it develop? Is it from writing graffiti or working on the street, or is it something specifically developed as an approach to mural work? The images and ideas I depict are often unique to each space and each wall. When creating the content of a work, I try to tailor the design to the space and the surrounding communities of that particular area, while still developing my personal style and visual language. I often try to project my own ideas and narratives within a piece, but it is up to the audience to interpret their own meaning behind each unique design. I often listen to hip hop as I am going through the design process as the lyrics inspire me with narratives, quotes and ideas that I can interpret visually as my own. In terms of visual artists, Tristan Eaton is a big influence, as is Pose MSK, and James Dawe, they all experiment with composition, colour, and mixes of rendering quality. I love the depth created by complicated works and have great respect for artists who can balance it all into a resolved piece. I try to design separately before beginning a final painting, mainly because having a full understanding of what you are attempting to create once you are actually at the wall aids productivity and allows me to focus solely on generating quality rendering while having the confidence of knowing that the composition and colour choices work. In saying that though, there are some details, particularly line weight variations, such as fat cap flairs and ultra-sharp outlines, that cannot be generated by pencil or marker but only by aerosol. This allows the piece to grow somewhat organically especially once you are standing up throwing and extending your arm completely, rather than seated, drawing or on the computer. Time and practice have given me the experience to develop my own techniques for painting, I appreciate that spray paint is traditionally a self-taught obsession. My original drive and passion for graffiti and street art was rooted in the development of style, so I have tried to establish my own. I do think I take influence in every form though, whether it is subject, composition or technique. When teaching yourself all the influences you reference are based all on your own taste. I personally go through obsessions with different artists’ styles. For example, when I began painting with aerosol and focused on letterforms, I was influenced by Peeta’s sculptural abstract forms, but there wouldn’t be much evidence of that in my work now. Spray involves building a skeletal sketch form, blocking in tones and layering details. Before I was getting opportunities to paint big walls I honed my skills painting canvases with aerosol only, no stencils, as I wanted to be able to paint everything freehand. This meant it took me a long time to produce sharp, well-proportioned work. But the skills I built up translate to big walls well. If you can paint a detailed portrait on a canvas with spray, the rendering quality on a wall is amazing. Brushes never gave me motivation to produce work because it felt like a chore. Even when I was just starting out, cans were addictive because you can throw so much paint around quickly. To me, it feels like the most powerful medium of creation and destruction. However, as I grow as an artist I want to produce things that aren’t really possible with freehand spray, so I am looking at screen printing and have been producing digital work longer than I’ve been spray painting. 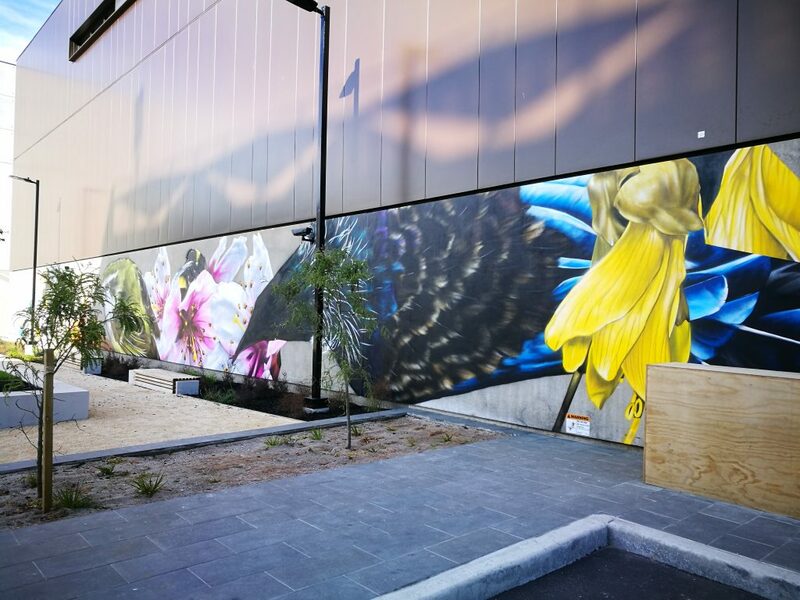 Tell us about the concept behind Organic Matters, the Justice Precinct mural? Are there symbolic reasons for the choice of specific bird life and flora? Does the absence of the collage-style fills significantly alter the way you conceive of the wall and how it might respond to the space it occupies? Organic Matters is a play on the term organic matter. I’ve used this title to mimic the important activities going on within the Justice Precinct buildings while relating back to the natural subject matter. Using all native local birds and flowers, with the exception of the cherry blossoms, which refer to the gardens of Christchurch. For this particular client, the professional nature of the location and the range of people that will see the mural, the less provocative, stylised realism fills worked better than the graffiti collage style I often work with. Yes, taking away a part of the subject matter I use affects how I conceptualise a work. Instead, the design focused on expressing my style and originality through composition, line, and colour, rather than the higher visual contrast created by mixing subjects and rendering styles. The feedback was great. 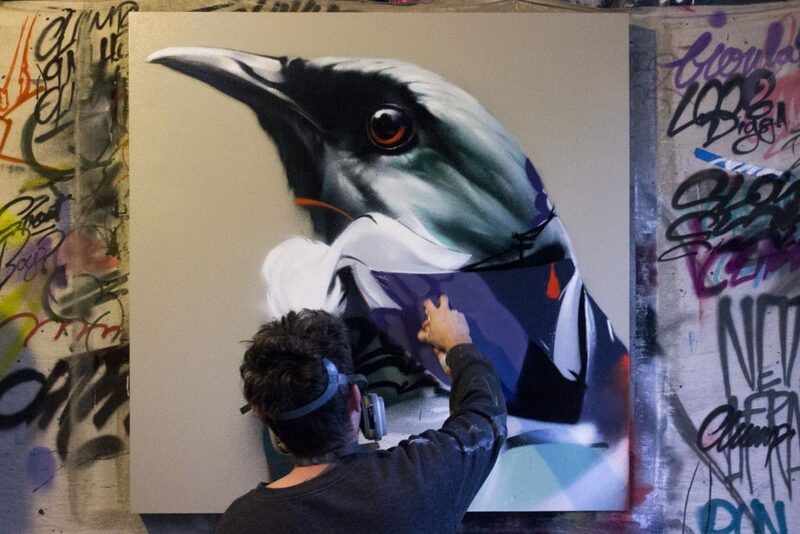 People who appreciate graffiti and street art were stoked with the process and can work, and everyone appreciated the birds, particularly the identity and life projected through the eyes. I had good chats with road workers, with people coming out of the police station, officers, lawyers… Overall it seemed like the people of Christchurch are very supportive of their growing urban art scene! Did you have a preconception of the city before coming down? Were you aware of the scene down here, or at least the profile? I have a lot of family in Christchurch, so I have visited many times growing up. But this was the first time as an adult. I’ve admired the street art festivals in Christchurch since the quakes and the graffiti scene seems to have exploded with the derelict spots providing canvases everywhere. Did you explore the city? Or did you hit the ground running on the wall? Any favourite pieces or spots? It was pretty much just two weeks of painting the wall, with a couple days of rain to relax and try some of the different places to eat in Christchurch. I would have liked to have painted with the locals and had a go on the giant cans [on Manchester Street], but it was straight back to University classes the day after I got back home. B List Tattoo looked after me with paint supply and even organised shipping the leftovers back for me, so that was awesome. 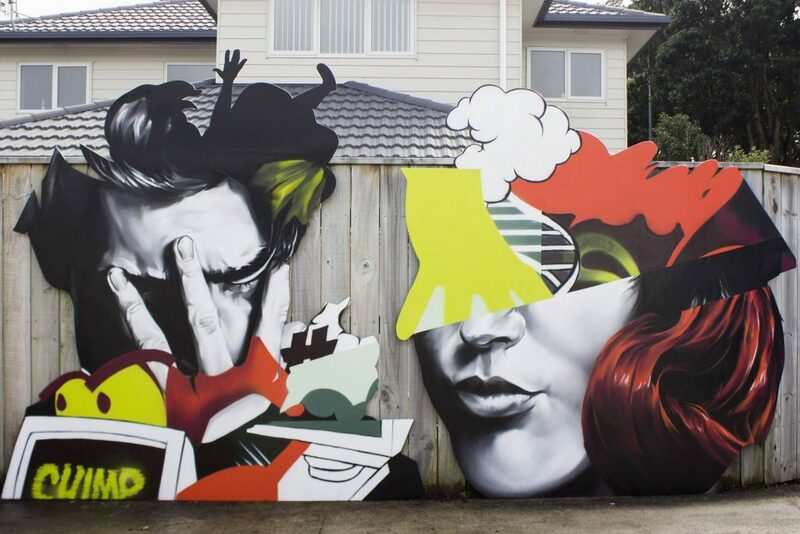 Even without getting to spend time painting with any local artists, how did you perceive Christchurch from Wellington in terms of the way urban art is part of each city? What is your take on the scene in Wellington? I would say Christchurch’s scene is exploding with all of the exposed walls that can be seen from far away with all of the empty lots, whereas Wellington has tighter alleys and more hidden gems. 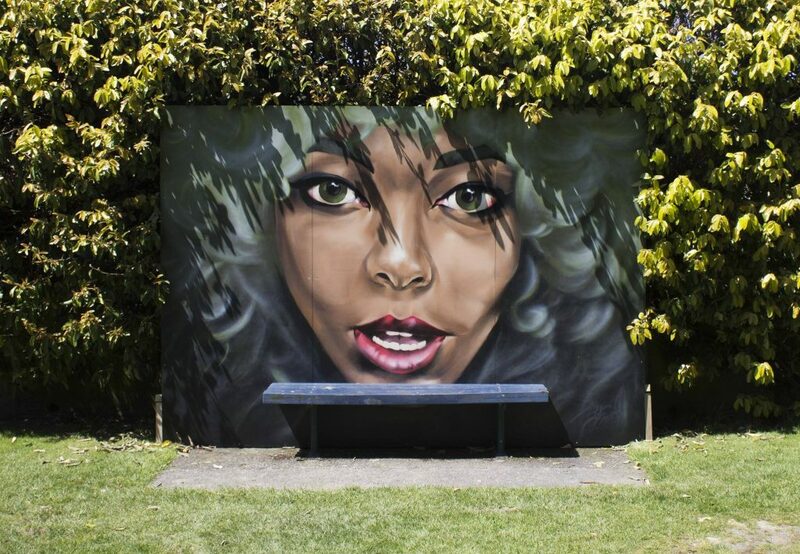 As street art has become more accepted there has been significant growth in commissioned work while the streets are always being painted with fresh graffiti in both cities. Christchurch seems to be celebrating street art more than Wellington for the amount of large scale work being done and the dedicated events like Spectrum. Wellington’s smaller spaces would be more conducive to certain interventions, while you can see the natural fit of larger murals in Christchurch… I have always felt Wellington was a bit more varied in what you can find in the streets, that there was a wider range of approaches, would you agree? And what about the geographic lay-out, with the spread of the city, are there different scenes in different parts, like from the central city to Upper or Lower Hutt? I think with the number of international pieces in Christchurch, as a result of the various festivals, there is a good variation of style. Although Wellington does have visiting styles too. I would say that urban art is more condensed and apparent within Wellington city. 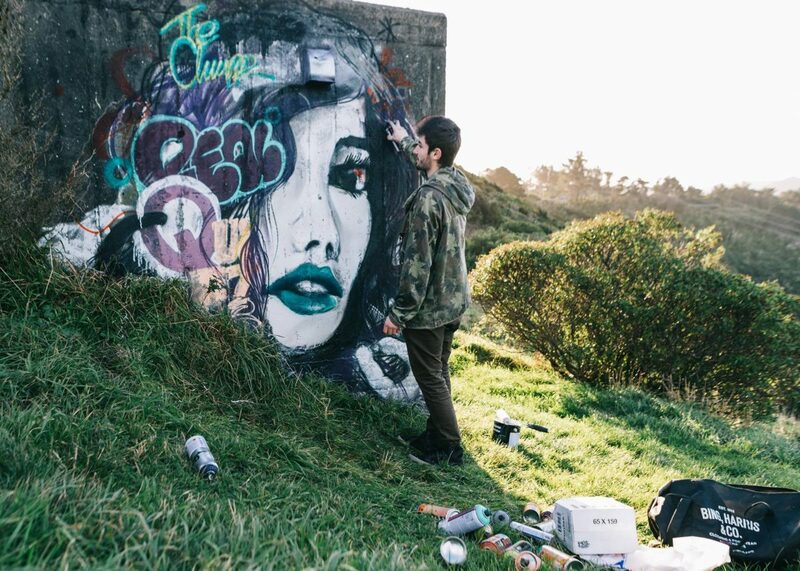 The Hutt has graffiti scenes which fluctuate, however, the buffing is relentless. Waitangi Park is the only free wall I’m aware of in the region which evolves constantly, with several abandoned spots which are also ever changing. You are currently studying, but not in the perhaps more expected visual arts field, is it some type of engineering? Close, I’m actually studying industrial design. It sort of sits between graphic design and engineering, which involves creating product form and understanding function. It is a four-year degree with honours and has taught me a lot about empathetic understanding and catered design. I gravitated to industrial design from graphic design partially as a result of the overwhelming number of students studying graphic design and an interest in car design. Imagining a graffiti artist with an industrial design degree also seemed like an interesting thing to do! Haha, sorry, I was a little bit off the mark there with engineering! Is there a valuable practicality that you can draw on when painting murals? The main thing I have taken from industrial design is a greater understanding of creating emotion through form and how subtleties can be used to express ideas. Also, my perspective sketching is getting much better and I have one semester to go. Any creative degree educates you on critiquing work and I have personally found it an experience of exiting an ignorant bliss that I began creating art from and realising a harsh balance of self-critique and confidence. So, once you have finished, will you still compartmentalize the two; visual arts and industrial design? Or in some ways will they move closer together? Will you likely freelance as an artist and designer, or focus on one or the other? Industrial design is a niche area to find employment and I think it takes full dedication and drive to make it happen, just like working as an artist. I can see myself designing products under my own brand, if I found an idea worth pursuing in the future. I manufactured and sold skateboards under the brand Planetary from the age of fourteen until I was seventeen. But I would say my ambition is firmly in my work as Chimp and spray paint currently. What were you doing with the Planetary brand? Was it deck designs? Clothing? What did it encompass? Planetary was the first brand or alias I ever worked under. I built downhill skateboard decks intended for the twisty roads of Wellington and skateboard racing. From there I started trying to produce spray paint graphics but lacked the skills. So that led to the aerosol campaign. I learnt a lot and sold quite a few boards but found selling handmade functional products to a niche market quite stressful. What has kept you occupied since the Justice Precinct mural, and what have you got coming up? Any plans to come back to Christchurch? I’m currently working on a t-shirt design for Kathmandu, within the same artist line that Wongi and Shraddha produced designs for. I have a new piece in Moonlight, a group show in Auckland held by The Designers Institute and RAYDAR. My piece is called Between the Raindrops. A design I submitted for the QT Museum Hotel competition was selected, so I will be painting a room or two there. I am quoting a few jobs around Wellington at the moment that I’ll be able to get onto once University is finished, and I have a handful of private commissions I need to get done! That’s a fair bit going on! Did the Kathmandu t-shirt opportunity come about through the Justice Precinct mural? What can you tell us about the t-shirt design? Was there a specific brief to respond to? The brief was quite open, but the key points were encouraging or capturing a sense of adventure and comparing the countries and culture of Nepal and New Zealand. And the QT project must be pretty exciting. That involves DSide, right? What have you proposed for that? Dside was one of the judges and I was humbled to be chosen. I put together a few different options, but you’ll have to wait and see the outcome. You also mention the group show, do you exhibit studio pieces regularly, or is it secondary to walls? I’ve had one solo show and been in several group and duo shows, but I get more satisfaction designing for bigger spaces that everyone gets to see. Spray paint lends itself to a large scale too. Once you’ve learnt to paint small details with a can, the larger work starts to really pop from the detail that you can fit in. So, do you think of studio work as separate to your wall work, or does it function like preparatory work, feeding into your outdoor practice? They are certainly intertwined. Sometimes the experiments are done on public urban walls and sometimes at smaller scale privately. Ultimately both help me learn and the more you paint both the easier it is to adapt to either. Thanks Chimp, I know people have really responded to your Christchurch wall, so hopefully we see you again down here soon!